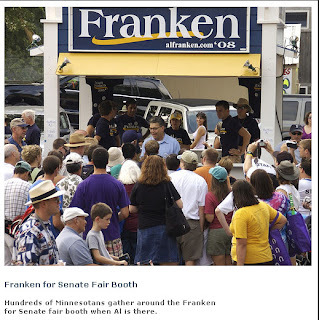 Al Franken wins primary and will now face off against Republican Sen. Norm Coleman. ST. PAUL, Minn. (AP) — Comedian Al Franken grabbed the Democratic nomination Tuesday for U.S. Senate in Minnesota, setting up a showdown with Republican Sen. Norm Coleman. Franken, who gained fame as a "Saturday Night Live" cast member, easily beat six other candidates chasing the Democratic nod. Coleman trounced his only opponent, an expatriate living in Italy. Franken's celebrity has both helped and hurt him. His coast-to-coast recognition enabled him to amass an impressive bankroll for a first-time candidate, but archives full of racy material provided ammunition to Republicans and his most visible Democratic rival, attorney Priscilla Lord Faris.